This will sound sacriligious to some people, but I have never really liked soda bread. I've made it in an emergency when I've realised I am out of the regular or sourdough sort, but usually I avoid it. I never managed to make one which, presumably due to the bicarbonate of soda and lack of strong/sweet flavours to counter it, always tasted bitter, particularly in the crust. Anyway, a couple of days ago, I decided to try again. I was out of bread, the kids needed some for breakfast (my step-daughter is refusing to eat porridge at the moment) and it was too late for me to want to start baking bread. Soda bread it was. A week ago I had talked to a couple of Irish friends about it, and they both said - try treacle soda bread instead. 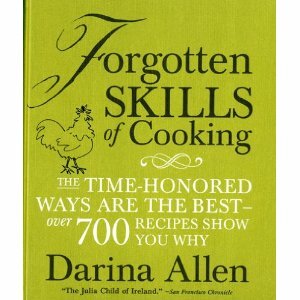 I turned again to Darina Allen's Forgotten Skills of Cooking - a wonderful book, especially for people like me who prefer to do everything from first principles and like the whole Good Life way with food. I had already tried her brown soda bread, which unfortunately was too bitter for my tastes. The treacle version was perfect. I followed Darina's instructions for making an approximation of sour milk first (add 2 tbsp lemon juice or white wine vinegar to milk, it will start to thicken immediately), then made what is probably the quickest, easiest soda bread ever. The ingredients are minimal - a bonus actually, as most soda bread recipes have egg in, and my son is currently allergic to them (major vomiting and horrible lumpy rash. Not nice and very inconvenient). Preheat the oven to 230C. Mix 450g plain white flour, 1 tsp salt & 1 tsp bicarbonate of soda together in a bowl. Whisk 2 tbsp treacle into 400ml sour milk/buttermilk*. Add most of this to the flour and mix. The dough should be soft, but not too sticky. If it's a bit dry, gradually add a bit more of the treacle/milk mixture. Shape the dough into a round of about 2.5cm deep and cut a deep cross into it. Bake in the oven for 15 minutes, then turn the oven down to 200C for around 30 minutes or until nicely browned and hollow sounding when tapped on the bottom. This bread has been a great success in our family. The sweetness is slight enough that it still works with savoury (I like it with strong cheese), but is enough to offset the bicarb. It also keeps well (still has a good texture after a couple of days and toasts very well). I am going to experiment by using different flours and adding malt extract next time. *the one thing I would suggest about the method is that the treacle should be mixed into just half of the milk, just in case you don't need to use all the milk - that way all the treacle will be incorporated. Wouldn't lashings of butter melting through the warm soda bread and a thick layer of jam provide the right sweetness? Wow. I am impressed at the length you go to to write about food. Such dedication is hard to find. Yes I agree with you .. people have forgotten the basic cooking skills. That is such a shame.